Business experts and consultants said it wouldn’t fly. But David Morrison, a former civil engineer, had done plenty of informal polling and knew his neighbors would support an upscale sandwich shop. Almost 25 years later, he’s proven his point, which was simply, “it will work, if you give them a good product for the money.” Now Deli Dave’s is the longest running dining establishment in Pueblo West. Of course, his timing was spot-on. There were only 4,000 people in town when he opened his doors; now the population’s hit 32,000. 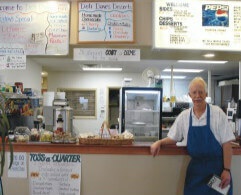 Deli Dave’s is the kind of place the locals go — and recommend to out-of-towners. He buys Callicrate Beef top rounds, slices and grills them to order to make an array of roast beef, cheese steak and beef dip sandwiches. Originals like “the Hoss” — lean barbecue beef with jalapeno pepper and three kinds of cheese — and “the Savage” — sliced steak with bell peppers, mushrooms, onions and melted cheese — hook customers who develop a taste for them, because they can’t be found anywhere else in town. “People ask about the beef, and we tell them where it comes from, and sometimes people utilize that information to go to Colorado Springs and get their own,” he says. He’s a health conscious eater himself who likes the fact that there’s no artificial hormones or continuous-fed antibiotics used in Callicrate Beef production methods. “It’s great. I won’t use any other meat,” he says. Dave observes that when he started his business, the ratio of corporate to independently owned restaurants was about 60-40. Now he believes that ratio is closer to 80-20. “The mom-and-pops are being eliminated,” he says. Meanwhile, the food quality and service at fast food establishments is declining, he observes. When he travels, he asks the locals for their recommendations on where to eat, by-passing the chains. Deli Dave’s has been forced to move into larger locations three times over the years, proving his theory from a quarter century ago: quality counts. He can seat up to 60 in his clean welcoming shop. “We do things nobody else does,” he says. Not least of which is using wholesome, unprocessed sliced beef. “It hasn’t been easy. It’s been a lot of work,” he adds. “The last couple of years have been volatile for everybody.” Still, Dave says he wakes up “ready to go” every morning. He and his team pass on that joyful spirit to loyal locals as well as travelers just dropping in.